3herosoft PDF to EPUB Converter - The best PDF to EPUB Converter to convert PDF to EPUB. Free try this powerful PDF to EPUB converter now and view your PDF content with EPUB format anytime and anywhere! 3herosoft PDF to EPUB Converter allows you to easily convert PDF files to EPUB files, so you can view them on any eBook readers compatible with EPUB. 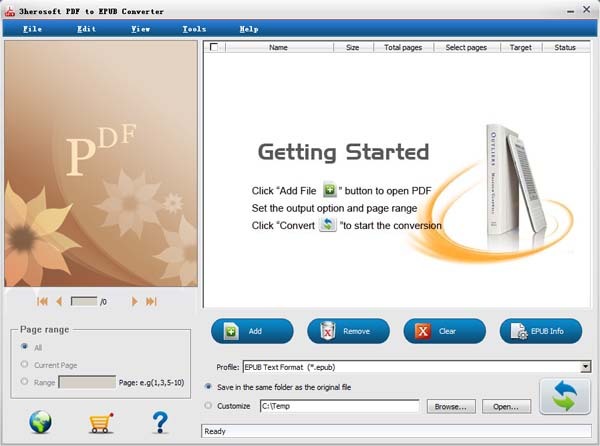 3herosoft PDF to EPUB Converter software is a standalone program for PDF to EPUB. It does not need Adobe Acrobat or other third-party controls support. 3herosoft PDF to EPUB Converter can convert PDF pages with text or picture mode to EPUB. At times you need to convert only selected pages of your document. In this scenario, you don’t need to convert the complete document. 3herosoft PDF to EPUB Converter allows partial document conversion. Specify the pages or page range for conversion and the tool will convert the document accordingly. 3herosoft PDF to EPUB Converter can convert PDFs generated through any application into EPUB. This makes this tool quite versatile. How to edit ePub pictures while converting PDF? How to modify the info of ePub files while you converting PDF to ePub?